Intel Core i9-9980XE Extreme Edition skylake-X LGA 2066 - 18 cores + Hyper-Threading / 36 threads, 3.0Ghz box CPU / 4.5Ghz turbo boost, 44x PCIe lanes. 14nm, SSE4.2, AVX-512 (512bit Advanced Vector eXtensions), BMi2, FMA3, VT-x + VT-d + AES-N, built-in Quad channel DDR4-2666 (non-ECC only) memory controller, support up to 128Gb, 85.3GB/sec memory bandwidth, 18mb L2 cache + 24.75mb L3 cache, 165w - box CPU with no fan Copyright © 2019 ComXpert International CC - COPYING IS ONLY ALLOWED FOR THE PURPOSE OF SENDING US ENQUIRIES. E&OE. The best price and guaranteed service and backup from official computer suppliers in South Africa for the CP-iX9980XE Intel Core i9-9980XE Extreme Edition skylake-X 3.0Ghz 18 cores 36 threads LGA 2066 Processor. The Intel CP-iX9980XE Intel Core i9-9980XE Extreme Edition skylake-X 3.0Ghz 18 cores 36 threads LGA 2066 Processor is available for R36840. The product is sold by ComX Computers as new. Prices are valid today 2019-04-22 (before 2019-04-23 , by quote, while stocks last). The product is expected to be in stock, although this is not guaranteed. 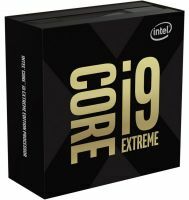 Find related CP-iX9980XE Intel Core i9-9980XE Extreme Edition skylake-X 3.0Ghz 18 cores 36 threads LGA 2066 Processor products in our Intel Core i9 Socket LGA2066 Processors Category for even more options. Read reviews and find out about CP-iX9980XE Intel Core i9-9980XE Extreme Edition skylake-X 3.0Ghz 18 cores 36 threads LGA 2066 Processor. Discounts, specials and cheap prices only at ComX Computers.